Lector CD rom marca Creative velocidad 24x. Funciona. Es lento. Probablemente necesite una limpieza interna para mejorar su rendimiento. Creative iNFRA 5400 36 x CD-ROM drive CD3621E CD / disco IDE R blanco / blanco. Acelerar 36x (CD). Disco duro / unidades de disco duro. Interfaz / Conexión IDE / ATAPI (P-ATA). • por lo general asociados con cualquier sistema con IDE (P-ATA) Conexión compatible. Lettore CD 48x e DVD 16x Waitec;. Lettore Masterizzatore CD Waitec Storm 40;. Lettore Masterizzatore CD Creative 12 10 32x;. Creativo iNFRA 5400 36 x drive CD-ROM CD3621E CD / unità IDE R bianco / bianco. Velocità 36x (CD). • di solito associati con qualsiasi sistema con IDE (P-ATA) Connessione compatibile. Disco rigido / unità disco rigido. A excepción de los que pongan para desguace/piezas o no se sabe si funciona. - EL ENVÍO PAQ72 ES SOLO PARA ENVÍOS A LA PENÍNSULA Y BALEARES. - En principio no se admite ningún tipo de devolución, ya que consideramos que la gente. Creative iNFRA 5400 36 x CD-ROM drive CD3621E CD / disque dur IDE R blanc / blanc. Vitesse 36x (CD). Interface / Connexion IDE / ATAPI (P-ATA). Couleur de l'iris blanc - beige. Nous allons essayer de trouver une solution rapide et juste pour vous! 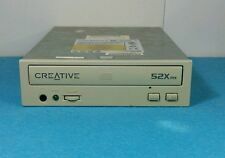 Creative 52Xmx CD-ROM Drive. Model number is CD5230E (M95133566). SHREDDER, LLC. For Desktop Computers. Internal Drive made by Creative. Fully functioning & designed for Desktop Computers. We didn't try to take it off though. CREATIVE LABS Model # CD5233E 52X Internal Desktop 5.25" CD ROM DRIVE 50010300000014 QC-PASS 2002/05, Cream Bezel. The Internal Drive is sealed with a label across the front disc drawer and also a small circular seal on the side seam that says "warranty void if seal broken.". Clean and ready to run. Creative 52x CD drive Model: CD5233E. Condition is Used. Shipped with USPS Parcel Select Ground. Quad Speed. November 1995. Do not ask us to misrepresent the value of an item. No local pickup. FCC ID : IU09TB059CRB. MFD : September 1997. Do not ask us to misrepresent the value of an item. No local pickup. P: 5001030000001 QC-PASS. Model : CD5233E. CD-ROM Drive. Do not ask us to misrepresent the value of an item. Interface / Connection IDE (P-ATA). Fans / fan. CPU heat sinks / coolers. CD DVD ROM Reader. MY nufacturer Creative. speed 48x (CD) / 16x (DVD). • usually associated with any system with SATA Connection compatible. 52X CD-ROM drive - untested. Creative Compact Disk 52Xmx CD Rom Drive. UNTESTED - NO POWER CORD. Unable to test as no power cord. Received from estate of individual who refurbished computers. Good Physical Condition.